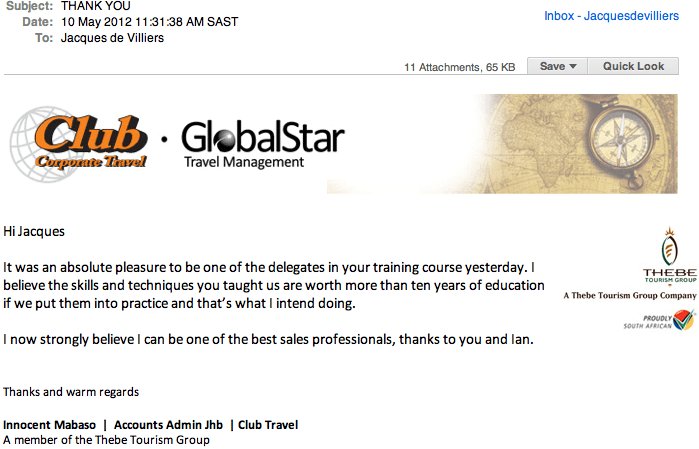 Looking for sales training courses in South Africa? Please note that this is an archived sales training courses page and is totally out-of-date. If you want to check out new sales training courses, click on sales training courses and you’ll be directed to the most recent offerings. 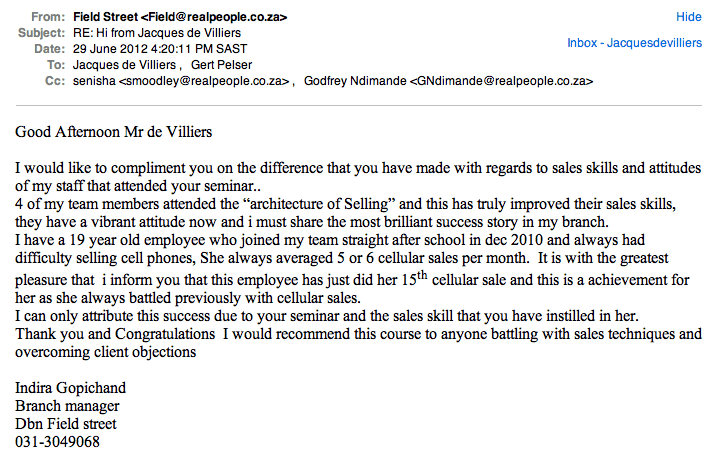 Due to demand, the Jacques de Villiers Group will be holding another public sales training course. We’ve contracted one of today’s most relevant and exciting sales trainers to run courses on sales for the Jacques de Villiers Group. The next public training course will be held on 17 October in Bryanston, Johannesburg. Find out more about the sales course now. The Architecture of Selling Public Sales Training Course will end its life in its current form on 15 August 2012 in Johannesburg, South Africa. It has had a good run and since 2002 has helped 1 993 delegates become more professional sales people. As a farewell present to anyone who attends the training course in the next month, I’m reducing the R1 897 to R997 per delegate. That’s a 47% saving! Helen Nicholson and Paul du Toit, CSP have each donated some of their books for “spot prizes”. Yes, there will be questions, so you do need to listen. You’re on this page for a reason, right? You want to close more deals more consistently and start earning real money for both your organisation and you. You know you’ve got it in you to make it in the sales business, but something is not working because you’re just can’t seem to hit the target set for you by your sales manager. Don’t worry, you’re not alone. Statistically, most sales people only hit 42% of their target each year. And, according to Lynette Ryals and Iain Davies in the December 2010 Harvard Business Review, only 9.1% of sales meetings result in a sale and just 1 out of 250 salespeople exceed their targets. That being said, there is still hope. Salespeople don’t make target for a various reasons – three of the main being a poor attitude, no system and no training. We can’t teach you attitude (you’re either going to love selling or you’ll be weighed down by the thought of selling), but we can teach you how to sell properly in the 21st Century. This is where The Architecture of Selling comes in. It’s a field-tested sales process that will help you crack the code so that you can become an exceptional sales professional bringing real return on investment for your organisation. The objective of this session is to master your emotions and your life and know your place in the world so that you can become a valuable player in your sales team. The objective of this module is to help delegates find the right clients so that they don’t waste time on clients that aren’t going to buy. A sale is like a date. You first have to build up trust before you ask for a commitment. The objective of this module is to help sales professionals guide the prospect through a process that leads to a sale. The objective of this module is to find qualified markets through networking and how to build a powerful prospect database. The objective of this session is to help sales people sell to the prospect how the prospect wants to be sold to. It’s all about the prospect and not about the sales person. The objective of this session is to use the language of persuasion to emotionally arouse the prospect to want to buy. This workshop is for new sales professionals and sales professionals that need to get out of the slump they’re in right now (if you’re not hitting your targets on a regular basis, you’re in a slump). A 47% discount on the 1-day rate (R1 897). Your investment R997! R1 980 worth of bonuses for free! A great experience and serious learning!